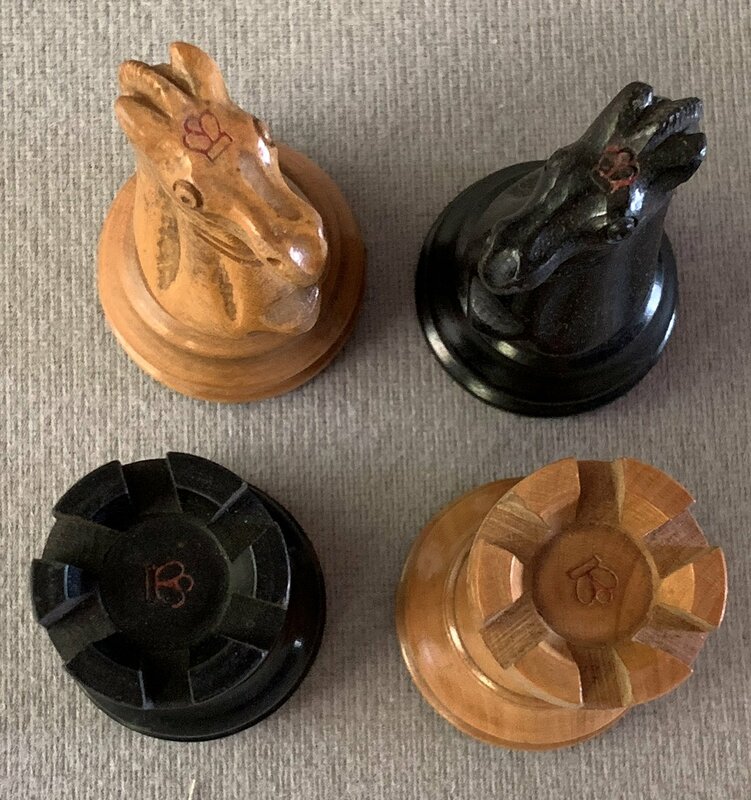 Antique Jaques Lasker Chess Set, Tournament Size, Unweighted, Circa 1885. 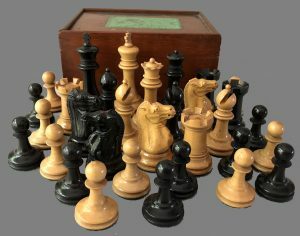 Offered here is an Antique Jaques Lasker Chess Set, circa 1885. The chess pieces are Boxwood and Ebony. 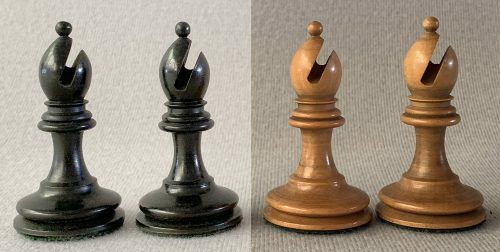 The King stands 3-1/2″ tall with a 1-3/4″ diameter base. These authentic Staunton chessmen rest atop green English baize and are unweighted. The Knights are of the Lasker style. The White King is stamped “Jaques London ” on the rim of the base. 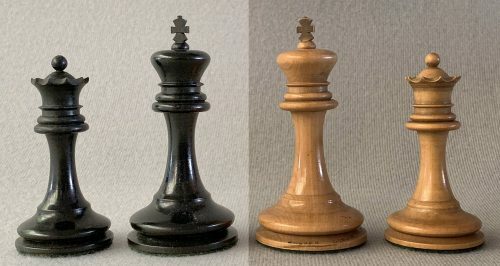 The Kingside Rooks and Knights are stamped with a red King’s crown on their summits. This King height is often referred to as the “Tournament Size.” The Knights are very finely carved. 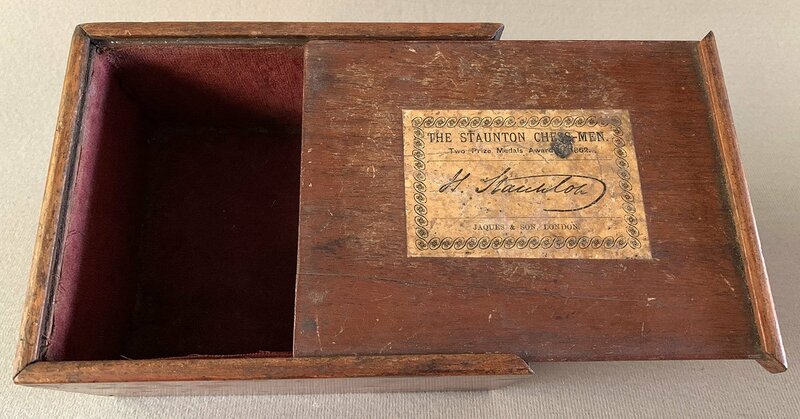 The Antique Jaques Lasker Chessmen are housed in their original Mahogany slide-top box with its correct yellow Manufacturer’s label according to the Camaratta Codex of Jaques Labels. The Lasker style sets were produced in the 1880s. The chessmen are in excellent condition. These chessmen play and display best on a chessboard with 2-1/4″ squares. 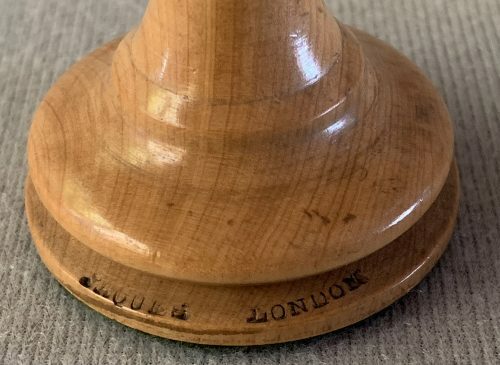 The antique chessboard shown is not included as part of this sale, but a period-correct Jaques chessboard can be found here. 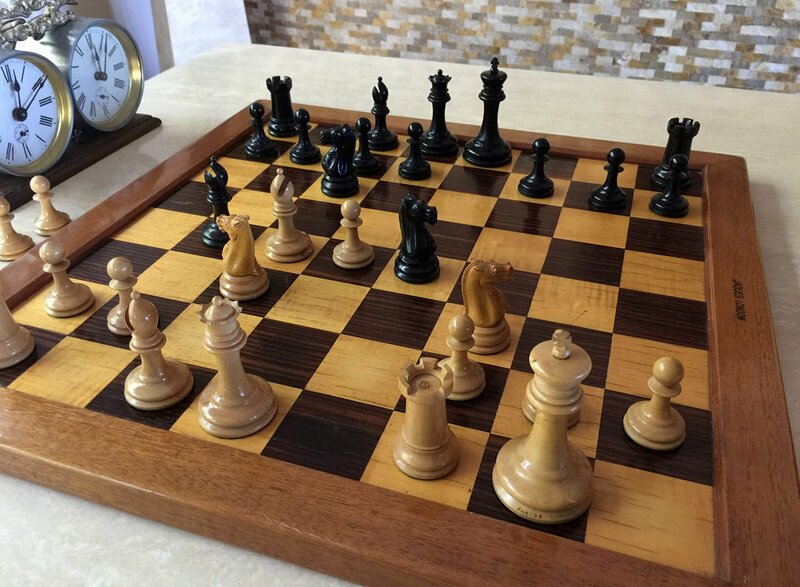 For a complete selection of our finest new and antique chessboards, please click here. For a short history of the John Jaques Company and the Staunton Chessmen, click here. Some interesting historical articles about chessmen and collecting can be found here. Emanuel Lasker was a German Chessplayer, mathematician, and philosopher. He held the World Chess Championship for 27 years (from 1894 to 1921). In his prime, Lasker was one of the most dominant champions, and is still generally regarded as one of the World’s strongest players. 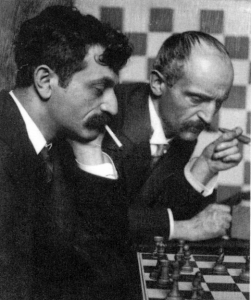 Lasker was considered to have a “psychological” method of play in which he considered the subjective qualities of his opponent, in addition to the objective requirements of the position. Lasker was well ahead of his time and used a more flexible approach to the position than his contemporaries. Emanuel Lasker was born in Berlinchen, Germany on 24th December 1868. As a child Lasker displayed a talent for both chess and mathematics. At age 11, Lasker attended a school in Berlin to develop his mathematical skills and he later went on to study mathematics at Erlangen University. Lasker’s record in match play was impressive. He won all his matches from 1889 to 1893. By the mid-1890s, Emanuel Lasker was clearly the World’s strongest player. In 1894, Lasker challenged Steinitz for the world championship. Lasker went on to win the match ten wins to five with four draws and, at age 25, Lasker became world champion Lasker was to retain the world champion title for a record 27 years. Between his 1896–97 World Championship re-match with Steinitz and 1914, Lasker has three successful defenses of his title. In his 1910 match with Carl Schlechter, Lasker was lucky to escape with a 5-5 draw due to a match provision requiring the Challenger to win by a two-point margin. Going into the final game, Lasker was down 4-5. Needing to win by a two-point margin, Schlecter, forced to play the last game for a win, over-pressed in a better position and lost. Lasker was in his early 50s when he finally lost the world championship to Capablanca and effectively retired from serious chess. During the war Lasker was forced to flee Germany. He was now penniless. In 1934, at the age of 65, finances forced Lasker to return to chess. In August 1937, Martha and Emanuel Lasker decided to leave the Soviet Union. They moved to the United States in October 1937. While, in the United States Lasker tried to support himself by giving chess and bridge lectures and exhibitions. Lasker died of a kidney infection in New York on January 11, 1941, at the age of 72. By this time, he was a charity patient at the Mount Sinai Hospital. He was buried at Beth Olom Cemetery, Queens, New York.